UPDATED SEPTEMBER 03rd 2013: Added new campaign images for menswear. UPDATED JULY 26th 2013: Added a new campaign image. UPDATED JUNE 11th 2013: Added a new campaign shot for menswear featuring Sylvester Ulv Henriksen by Josh Olins. Behold! Alexander Wang’s first ever Balenciaga campaign as creative director and it looks promising so far. The black and white image with strong noir feeling was photographed by Steven Klein and featuring supermodel Kristen McMenamy. Do you like the campaign and the new Balenciaga font? 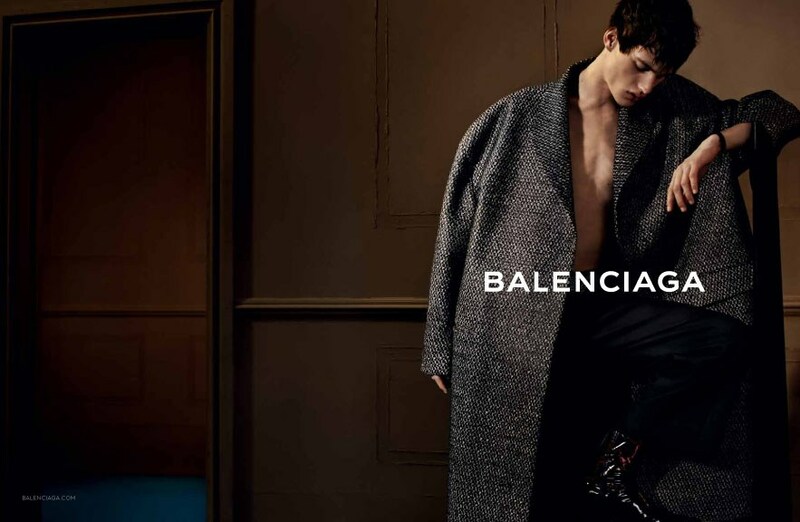 Click the links to view past campaign images from Balenciaga: Spring Summer 2013, Fall Winter 2012, Spring Summer 2012, Fall Winter 2011, Spring Summer 2011, Fall Winter 2010, Spring Summer 2010 and Fall Winter 2009. Another Vogue UK cover with the another collaboration between Kate Moss and Patrick Demarchelier. Click here to view last year cover also featuring Kate Moss, here for 2011 cover with Alexa Chung, here for 2010 cover with Angela Lindvall, and here for 2009 cover with Natalia Vodianova. Click here to view last year cover featuring Jennifer Lopez, here for 2011 cover with Nicole Scherzinger, and here for 2010 cover with Sarah Jessica Parker. Oh dear Brad, you look far less attractive now that you are 49 year old. Just saying. The cover was photographed by Fred R. Conrad by the way. Click here to view last year cover featuring Marilyn Monroe, here for 2011 cover with Katy Perry, here for 2010 cover with Didier Drogba and Cristiano Ronaldo, and here for 2009 cover with Jessica Simpson. UPDATED MAY 03rd 2013: Added a new cover featuring Karlie Kloss, photographed by Sean and Seng with styling by Beat Bolliger. The black and white cover is featuring designer Nicolas Ghesquière and his muse Charlotte Gainsbourg, while the other one is the elegant actor Cate Blanchett. Another reprint from “The Animal Nursery” editorial by Sebastian Faena with styling works by Carine Roitfeld. Click here to view last year cover featuring Vivian Hsu, here for 2011 cover with Cheryl Yang and here for 2010 cover with Kwai Lun Mei. Michelle Tran photographed the striking Indonesian born-Australian based model, Mikael Jasin (Vivien’s Model Management) for “Worn Out West” editorial which was styled to perfection with Asian flair by Jade Leung and published in ACCLAIM magazine. Caroline Massola responsible for Mikael’s hair and make up in the spread. The cover was snapped by Matt Jones and styled by Elissa Cannelle Castelbou.